Heat up 2 tbsp oil and fry all vegetables. Add potatoes to sesame oil ingredients into it by following the above list. When boil then add corn flour and water and leave on low heat for a few minutes and serve hot. 7 to 8 people easily. Boil 4 cup of water with salt and add gobhi into it. After boiling leave it for 3 or 4 minutes and prepare its marination batter. Mix all above marination ingredients and place the goby into it and mix into batter. Now grill the gobhi in oven on 220 c for 15 minutes after it cut into four pieces and serve it. Take a bowl and add 2 cups of flour yogurt, ginger paste, green chili paste, pepper and salt mix all these ingredients. And knead all these in flour. After it make 3 large ball of flour, pat them and fry with a 4 tbsp oil. Take a bowl and mix lime juice, red chili powder, white cumin,salt,turmeric,coriander powder, chat masala,brown sugar and mustard seed into a bowl. Now cut the small tomatoes in the middle and fill the masala into the tomatoes. Heat oil and fry tomatoes on high flame. Then cut 10 German chilies and add curry leaves into cooking batter. Now cook it for 2 or 3 minutes and cover it all for 15 to 20 minutes. Serve with boil rice. Mix all the ingredients Yogurt, Passion fruit, Bananas, Fresh raspberries, Strawberries, Apple juice, Ice cubes until a homogeneous mixture. If the mixture is too thick add a little amount of orange juice. Very tasty Fruit smoothie is ready. You may also add a few drops of honey or vanilla. Cut all ingredients into cubes. Remove the juice from canned fruit. Mix all ingredients. My little fruit salad is ready enjoying fresh. 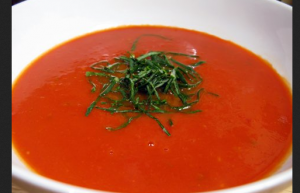 Tomato soup is a very creamy and delicious. It is easy to cook and is nutritious. Tomato soup can be served as a starter just before the main course. Take a pan and heat oil in it. Once it is warm put sliced onions and fry them till they are soft. Add garlic and ginger and fry them for 2 or 3 minutes. Chop the tomatoes roughly and add to the pan. Fry them for a minute or two. Chop potatoes and add to the pan followed by water. Season the soup with salt and red chili powder. Now let it comes to boil then cover it with a lid and cook it on low heat for about 30 minutes. Take off the lid and strain the soup. Then return it to stove and cook again for some minutes. Remove any scum on the surface. Now add lemon juice and black pepper and let it cook for 3 to 5 minutes. Now pour it in a bowl and garnish it with some freshly chopped coriander. Serve hot tomato soup with some bread. This is a very unique and nutritious recipe of carrot rice made from different style. It makes with carrots and spices like cinnamon and cloves. First of all fry the seeds until it turns brown. Add grated coconuts and remove from the heat. Crush them after it cools down. Grind separately, the fried groundnuts coarsely. Put the carrots in warm water. Heat the pan, pour the 1 tsp oil. Add red chilies, coriander seeds, cumin Grate it without peeling the skin. Heat the oil in a pan. Add cloves, cinnamon, mustard, broken black gram. Fry them. Finally add crushed groundnut and remove from the flame. Now our recipe is ready to serve. Vegetable Biryani is a nice and spicy recipe. It is the best form of Biryani for those people who dislike the meat. Wash first the basmati rice well before cooking. After it take rice with 3-3/4 cup water and a little salt added to it and 2 tbsp of dry fruits. Cook it in pressure cooker or in a pan or microwave. Sliced all the vegetables and fry each one of it separately in oil. Fry the green peas also. Take 1 tbsp oil in a pan and add mustard seeds, green chilli, cinnamon and caraway seeds powder, cloves, black pepper powder and stir for about half minute. Then add onions and fry them for a minute or till they get pinkish color. Take the yogurt and make it fine by putting in a blender for just 2 rotations. Add this fine yogurt and stir well. Heat it for about 10 seconds. Spread the vegetable Biryani out in a rice serving dish. Serve the vegetable vegetables Biryani hot with raita and pickle.